When I first set eyes on Taprobane Island I had no idea that a few years into the future I’d become friends with its owner, an expat British businessman who lives in Colombo and Hong Kong. At that time, I didn’t even know someone could actually own this fantasy vision that I glimpsed while driving down the beach road in Welligama, on the southern tip of Sri Lanka. Anyone who sees Taprobane for the first time would probably rub their eyes in amazement and look again. It’s a teeny, tiny, storybook island consisting of no more than a hill rising out of the sea. A mysterious, closed white gate faces the beach and you can just see the top of a colonial villa emerging from lush trees on top of the island. I was enchanted and fascinated by the sight, but at the time we were on our way to another beach further south and other than admiring such a charming vision, I didn’t think too much of it though on the way back a few days later I did insist that we stop on the beach and take photos of this mystical little islet. I still have those photos somewhere deep in my box of old photos. 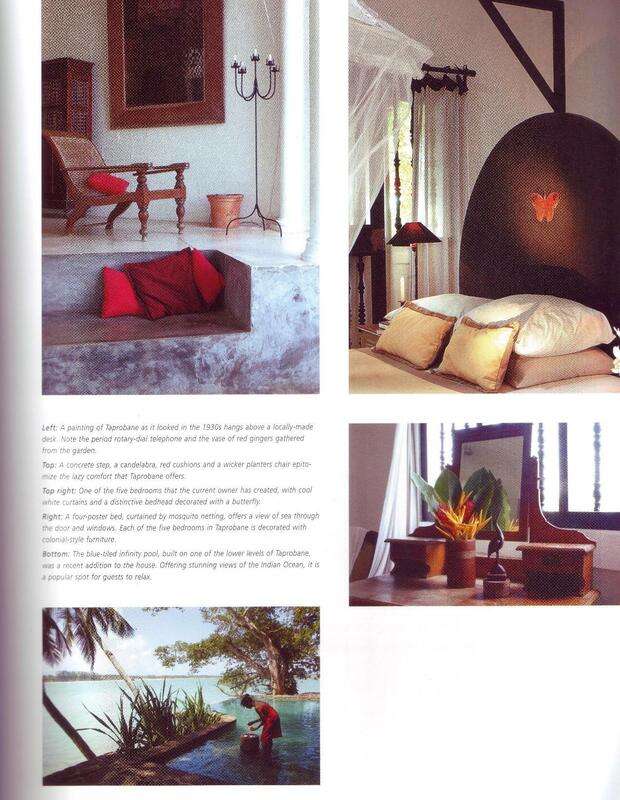 I also didn’t know at the time that the little island was a boutique hotel and that I’d be back to stay there one day. Sri Lanka has always been a magical place to me, with the sort of romance of things past and crumbling historic buildings that I absolutely adore, left over from waves of Dutch, Portuguese, and later British colonialism – Dutch forts, Portuguese churches, filigreed gingerbread houses, and British hill stations, a-plenty. But Taprobane was in a league of its own. It’s also Sri Lanka’s only privately owned island. So how did I end up coming back and becoming friends with its owner? A few years later, while working on a coffee table book The Legendary Hotels of Asia which was photographed by my colleague Jill, we went to shoot photos at Taprobane and waded across at low tide to meet the owner Geoffrey, who was having breakfast on the verandah with a group of his friends when we arrived. This stone stairway leads up to the villa. Welcome to your holiday home! The villa entrance at the top of the stone stairway. The door is always open, because the only people on the island are the ones staying here. Geoffrey is well known as the pioneer of luxury boutique hotels in Sri Lanka and owns the gorgeous Sun House and Dutch House in Galle along with other businesses in Colombo. I love this regal portrait of Geoffrey in the entrance vestibule. It depicts him like a Maharajah surrounded by his island and all things wonderfully Sri Lankan. Not long after that, he arrived in Bangkok to set up another business, by coincidence the same week of the launch party for the Asia’s Legendary Hotels book at the Jim Thompson house in Bangkok. Of course I invited him to join the party, and it ended up being a long night carousing around Bangkok in search of food and drink with a couple of my Bangkok friends and a couple of their Singapore friends and involved some changes of cars, someone knocking an entire glass of red wine down the front of my new dress, which by amazing good luck was a burgundy red and white BCBG dress so you couldn’t tell the difference, and some lost jewellery. And that’s a regular night out in Bangkok. Taprobane villa was built in the 1920s by Count Maurice de Mauny Talvande, said to be a “self-styled” Count with a very colourful, socially ambitious background. His first trip to Sri Lanka was in 1912 with the tea magnate Sir Thomas Lipton. He fell in love with the country and returned after WW I to find a tropical dream home for himself. No doubt Count de Mauny Talvande was enchanted by the romance of old Ceylon, as captured in this old print. 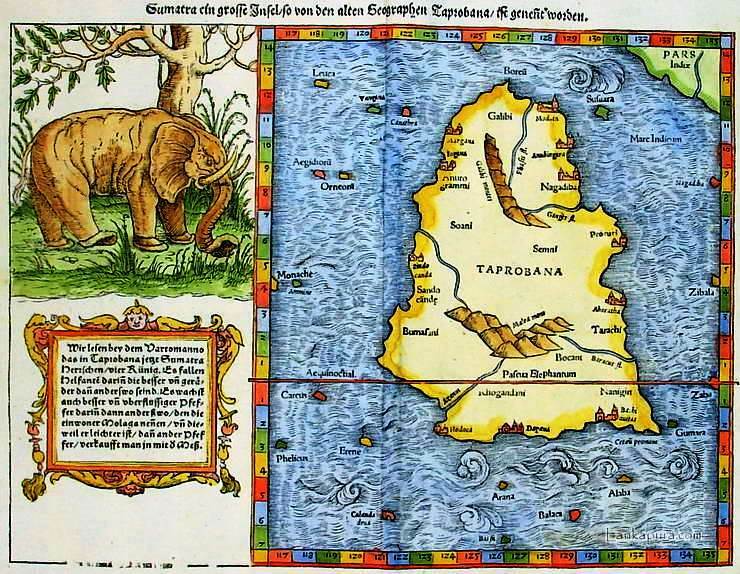 Sri Lanka was formerly called Ceylon and before that called Taprobane. He bought the little island when it was a horrible forlorn wilderness called Rock Island in Sinhalese, where the local people dumped cobras. It sounds vile. He called it Taprobane (the ancient Greek name for Ceylon, the former name of Sri Lanka) and built a unique octagonal, airy villa with a lofty central hall that had bedrooms fanning out from it and expansive verandahs that opened out in every direction; surrounded by gardens. He seemed to have been a man of good taste and creative talent, since he designed the octagonal villa, its furniture, and the gardens, creating a fabulous private world for himself. The house is surrounded by two acres of tropical garden with cascading terraces filled with frangipanis, palms, flame trees, fuchsias, hibiscus, bougainvillea, heliconia, bromeliads, monkey tail, orchids and white sandy paths that lead to secluded nooks around the island. Count de Mauny Talvande lived on Taprobane for 30 years during which he hosted kings, statesmen and aristocracy. He died in the 1940s. Taprobane was later acquired by American writer Paul Bowles, who lived between here and his home in Morocco. Paul Bowles is probably best known as the author of The Sheltering Sky which was made into a movie in the 80s starring John Malkovich and Debra Winger (I love the movie poster but not the movie itself, a slow paced, somber, endless film about a disgruntled, dysfunctional married couple to seem to hate each other. At least, that’s how I remember it). Paul Bowles made his home at Taprobane for four years, during which time he wrote the Spider House. Eventually he moved back to Morocco permanently and the island fell into neglect until a brief period in the 1970’s when the son of the French painter Balthus took over. In 1995 the present owner Geoffrey Dobbs took over and started restoring the property into a boutique hotel. This was my bedroom at Taprobane. My bedroom door is to the right of this sofa area in the main living room. The villa consists of five ensuite bedrooms, with various spacious sitting rooms, balconies, verandahs, tropical gardens and a lovely cliffside infinity pool. This is me doing my back model thing at the infinity pool. A boat in the bay was spying on this scene. I could see the sunlight glinting off someone’s binoculars aimed straight at me as I perched there posing in a bikini. It was rather creepy. 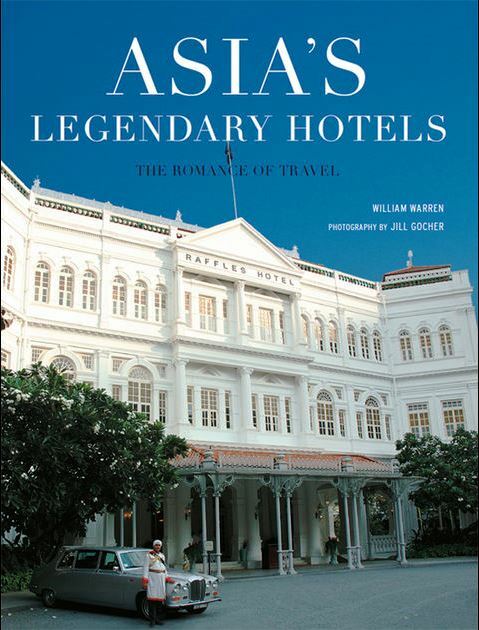 This photo appears in the book Asia’s Legendary Hotels, photo by Jill Gocher Photography. The household staff is on site to take care of you, and after arrival most guests never leave the island until departure time. Why waste your precious time on shore when you can make the most of every minute enjoying this fantastic private island? Another photo in the book Asia’s Legendary Hotels, this is me again adding flowers to the little stone pond in the pool. I’m wearing a Sri Lankan sarong. Not that you can see much of it, but the colour combo of bright orange and magenta pink are very Sri Lankan. Guest rooms can be rented individually or you can rent the entire villa, which is the same as renting the entire island. If you rent a room, you might have the whole mansion to yourself or find yourself sharing the villa with whoever else may be staying there, sharing meals with them and sharing use of the villa, which is so huge that there’s plenty of space for everyone to keep out of each other’s way, though occasionally someone can unintentionally wander into someone else’s room while exploring the premises since the mood is very relaxed and guests tend to treat the villa like their home and leave their doors open or unlocked. My bathroom opened into the garden. This happened a lot while I was there. Once I emerged from my ensuite bathroom in a towel just as another visitor wandered into my room (did I leave the door open? ), and later when Geoffrey took me on a villa tour, he opened a door to show me one of the sea view rooms only to find its occupant Dickon standing there in his underpants. Everyone was backing out of bedrooms apologizing profusely with, “Oops! Sorry! Sorry! Didn’t know anyone was in here! Just admiring the décor / looking for my room / wondering where my friend disappeared to!” etc. Everyone was good natured and we all laughed about it. Aside from remembering to lock your bedroom door, privacy is easy to find on the island, even with the house full of guests. The island is a much bigger than it looks from afar. Anyone wanting their own space can find plenty of quiet garden nooks to retreat to, all with sea views. Most guests do enjoy spending time together and congregate around the dining table for communal meals and chilling around the pool. Welligama is known as the fishermen’s beach, and the bay and beach are always filled with fishing boats. The soutnern area is also known for the famous traditional Sri Lankan stilt fishermen who sit on poles for hours fishing with rods, the way their ancestors did for centuries. The fishermen sell their fresh catch on the beach and if you see something you like, you can buy it and bring it back to the house and have the chef to cook it for dinner. While there, we met a random assortment of other guests – Dickon, a British expat investment banker from Hong Kong, landscape architect Henry from the UK, and three young gap year students who were spending their year as voluntourists before heading off to Oxford and Cambridge. There are so many fantastic dimensions to Taprobane – incredible heritage, colourful and famous inhabitants, brilliant tropical colonial architecture, and its location at the southernmost tip of South Asia. “It’s a straight line from here to the south pole,” Geoffrey likes to say. To me the most fantastic thing about Taprobane is its romantic seclusion, and the air of distant aloofness that gives the island its dreamy mystique. This is because there’s no bridge connecting the island to the shore. It can only be accessed by wading 200 yards across at low tide, when the water is ankle to knee high, and hopefully with someone else carrying your bags. Most people do this on foot, though for a precious few, an elephant or even sedan chair can be the transport of choice. If you are really in a rush, a helicopter transfer can be arranged too. A helicopter transfer to Colombo can be arranged if you don’t have time for the drive up and down the coast. On the day we left, it was midday and unfortunately for us, it wasn’t low tide. The water didn’t look that high from above, but when I stepped off the pier ladder into the water I was suddenly up to my armpits. I am not a tall person, and was carrying my laptop and shrieked in horror. All I could do was carry it on my head but the surprisingly strong tide was pushing me around and I was afraid I’d get swept off my feet. Luckily our new friend Henry had decided to come and see us off to our car, which was waiting on shore, so he kindly carried my laptop on top of his head, while I clung to his shoulders and paddled with my feet as he towed me behind him while pesky waves pushed against us at every step. The waves were strong and I kept getting swept sideways and shrieking at the back of Henry’s head as he plodded forth toward shore. Me: “Henreeeeeeeeeee! EeeeeeeeeeeK! EeeeeeeeeeK” splat! splat! splat! Sloshing around in this manner, moving forward one step at a time, it seemed a long way to shore and I was soaked up to my armpits when we got there. But it was all part of the eccentric charm of the place and my precious laptop stayed dry, thanks to Henry. I was sad to say goodbye to the beautiful little island, and our fun housemates, but we had other places to get to – there are just so many cool places to explore in Sri Lanka. I haven’t been back to Taprobane Island since then, but I know I’ll be back there again. Have you stayed at Taprobane Island? How was your experience there?